Central heating equipment is designed for attaching to new appropriately specified boilers and already inbuild boilers such as EKO-CK P and EKO-CKB P(nominal heat output from 14 to 90 kW) or EKO-CK and EKO-CKB (nominal heat output power 14 to 50 kW). The specialIty of model “touch” is digital control color touch screen. 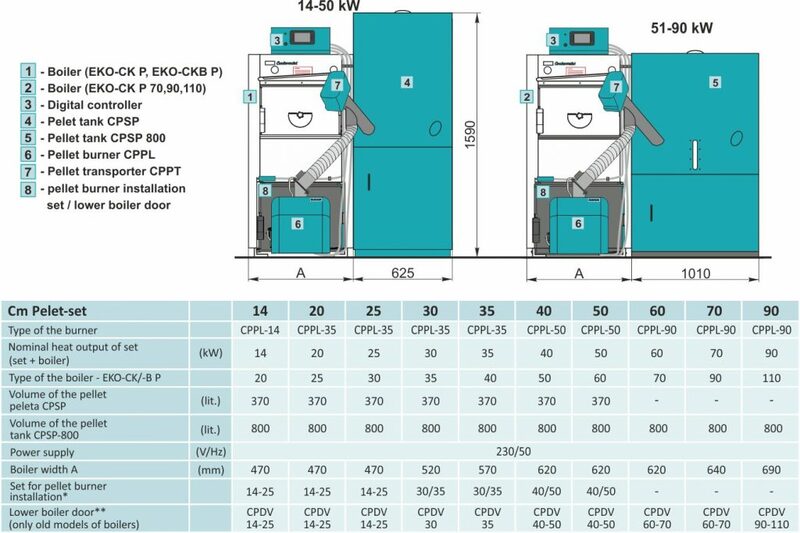 The Cm Pelet-set and the boiler together make a functional unit, i.e. a mini heating system for pellet firing. The automatic functioning of such a mini heating system offers a high level of convenience and makes them suitable for a wide range of users. Izrađena je u skladu s normom EN 303-5 i ISO 9001. Pellet is a renewable fuel and ecologically very acceptable. The fan and the electric heater installed inside the burner, digitally regulated automatically fires the pellets and keeps the fire in. Low emission of harmful compounds in the flue gases. Cm Pelet set – touch belong to 5th class of boiler standard. 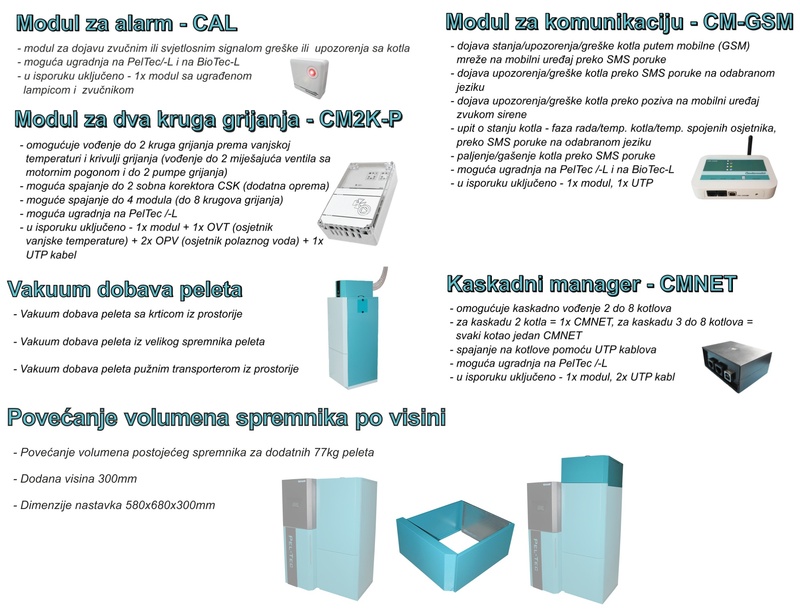 The Cm Pelet-set is delivered ready prepared for integration with the boilers EKO-CK P and EKO-CKB P with an nominal heat output from 14 to 90 kW or EKO-CK and EKO-CKB with an nominal heat output from 14 to 50 kW. 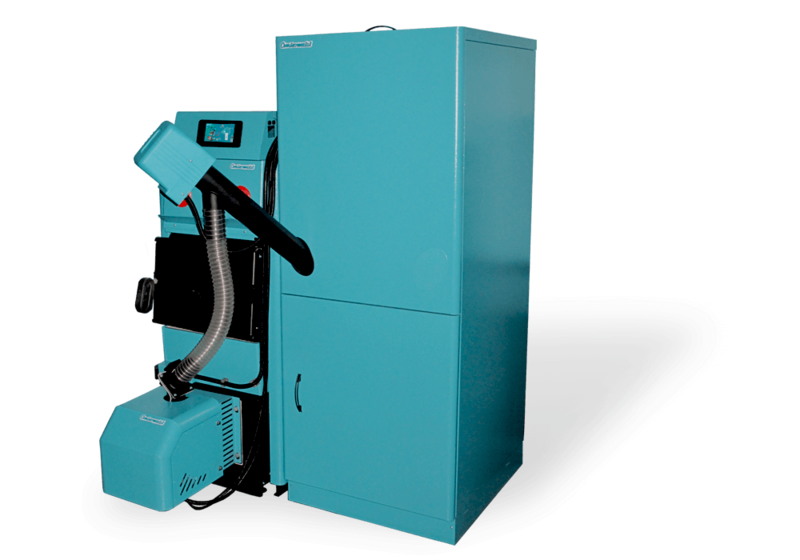 Together with the boiler it creates a functional unit, a mini heating system for pellet firing. 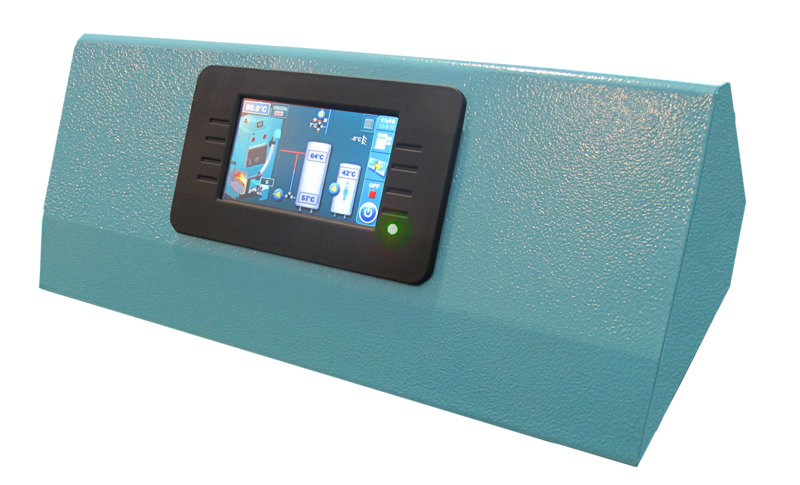 Multifunctional digital control with color touch screen display regulates the boiler function and can direct 2 pumps (e.g. one direct heating circuit and a plumbing circuit…). 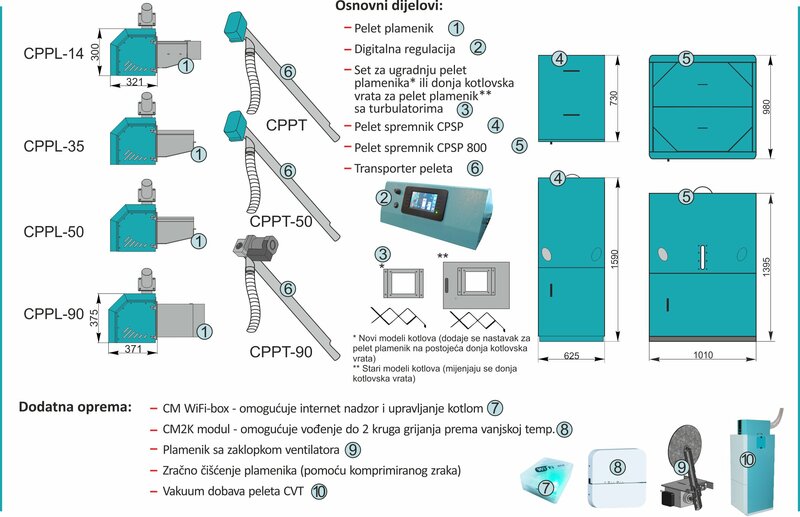 It is possible to connect the mini heating system directly to heating system or through accumulation tank (CAS) with a minimum volume of 10 l/kW and 3-way thermal valve on 60°C or motor powered 3-way mixing valve.. The fan and the electric heater installed inside the burner, digitally regulated,automatically fires the pellets and keeps the fire in. Cleaning, depending on the power of the boiler and the quality of pellets, after one consumed container (200/400 kg) lasts 5 minutes. Pellets container (volume 370/800 l) is a constituent part of the system and it is being filled from the upper side, according to need. It is possible to install equipment for automatic supply of pellets from a bigger tank through flexible pipes up to 10 metres in distance and up to 4 meters in height, exclusively for ENPlus A1 and DINplus pellets. It is possible to install a flap on the burner fan to prevent air from circulating through the boiler when the burner is not working. It is possible to install air-cleaning of the burner. Option to link several units in a cascade. It is delivered dismantled which makes it easier to transport and house. Wood pellet is a renewable fuel, and therefore ecologically acceptable. It is made out of wood bio-mass scraps extruded into pellets by special machinery. Pellets are delivered in various ways: in bags (15 kg or 1000 kg), or as bulk into large, possibly underground, storage tanks (4 – 15 m3) or into basement spaces or sheds.